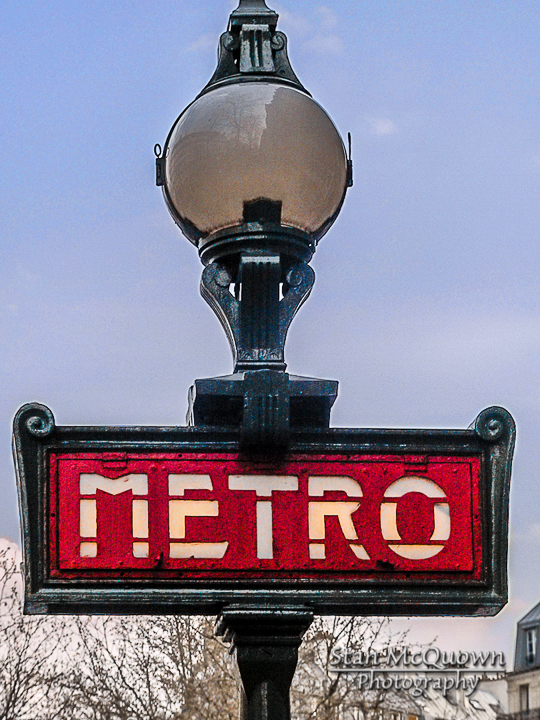 ~ This blog is about the planning, development and execution of our Paris Photo Trip in April 2014! Today we started pulling out all of our travel gear, luggage, power converters, anxiety pills and the such! Can’t find that one mono pod leg that makes into a tripod, gotta be here somewhere right? Now the cat stays here or did we commit to the little fur ball that we would take him with us, better check with the neighbors and make sure someone is going to be home to feed the little fellow? Don’t need any animal rights groups standing at the door when we get home from Paris! Now I can only take 3.3 ounces of any one liquid but I can pack as many lithium batteries in my luggage and carry on as I want? Is that right? Please someone invent teleportation because the rules of traveling on an airline are just crazy, non-sensible and scary. If you have ever had a perfect air travel trip, meaning everything that could go wrong, didn’t, you are one lucky person! Our luck has only happened like that once, back in 1993 on our honeymoon to Key West. It was a red eye from Sacratomato to Miami via a change in Hotlanta at 5am. The nice lady at the SMF airport upgraded us to first class all the way through to MIA. When we went to get our rental car they bumped us up to a full-size luxury sedan. When we got to Key West they made a mistake and over booked our room type and gave us the rooftop penthouse. The next night we woke at 3am to a gang of Hell’s Angels going through the lower floor on their bikes, it was great entertainment from our vantage point! Trips like this don’t happen very often when you travel using airlines and rental car companies, but this was one of those exceptional adventures that you just don’t forget, because it’s like hitting the Lotto, it just is not in your odds to have an exceptional worry-free trip like that, it just doesn’t happen that often! Oh, by the way, our trip home was uneventful, just the way we liked it! Preparing to take some time away from home and going abroad is always completely different than just staying here in the states somewhere. You have to really think about all of the possibilities that may come flying at you when you just can’t get to your own bed in less than a day. Are all your bills paid, are you going to have any bills arrive while you are gone overseas and when will they be due, can you prepay some of your bills or use an auto pay to cover the ones that will show up when you are not home. Did you stop the paper? Did you stop the mail? Is the cat going to get fed, are the plants going to get watered. Do all of your kids know how to get a hold of you in case of an emergency. Little and small things like that are what keep you up at night thinking about all of those possibilities! Technology has truly changed since our last trip to Paris in 2003; smartphones, tablets, video chat and now we have x-ray machines at the airport, it is amazing how far things have come! No “Beam me up Scottie” yet though! Teleportation would really be nice, not that I mind the way you are treated like cattle at the airport or on the plane itself for that matter, but going to a neutral third party that has your best interest at heart, because if they don’t get you to your destination and back safely and wholly, they pay real consequences. You know, an eye for an eye, just like the good old days where you were actually accountable for the thing you made and did to others. Preparation… probably the thing you have to prepare for most when going to Paris is the way you will need to start looking at life again. “C’est la vie“, “That’s life” a great phrase, it gives you the freedom to enjoy yourself without any guilt for now you can just roll with what ever comes at you and you can deal with it or not. Paris isn’t just a City, but a way of life and love and beauty; it is many things to many people, but to me it is a life saver, knowing she is there and knowing that she will never change, Paris, we can’t wait! Today I went through our stash of French money from our previous two trips to Paris, I was happy that I did that, Keerrr Ching! First there was a nice bag of French Francs, don’t even know if they are worth anything, but what the heck, they might be good somewhere? Then came the bag of Euro trash, whoops, I mean coins, hehe! 43,93€, score! Along with two 20€ and a 10€. This pays for our ride from the airport to our apartment in Montmartre, SWEET! Wow, 10 days and counting, I guess you can now say, we have a count down. Let’s just hope we never have to say “Houston we have a _ _ _ _ _ _ _ _”! Getting our ducks in a row! We have our two padlocks that have been properly labeled for our visits to the Ponts des Arts and the “Lovelock Bridge”, Pont de l’Archevêché. Back in the olden days, pre 2004, the idea of going to one of these two bridges with your lover and placing a padlock on the bridge’s wire railing and then throwing the key into the Seine River was unheard of; now it is almost impossible to find a bare wire to put your padlock on, we are hopeful! A love lock or love padlock is a padlock which sweethearts lock to a bridge, fence, gate, or similar public fixture to symbolize their love. Typically the sweethearts’ names or initials are inscribed on the padlock, and its key is thrown away to symbolise unbreakable love. Since the 2000s, love locks have proliferated at an increasing number of locations worldwide. In Paris Town Hall in May 2010 expressed concern over the growing number of love-locks on the Pont des Arts, Passerelle Léopold-Sédar-Senghor and the Pont de l’Archevêché bridges, stating: “they raise problems for the preservation of our architectural heritage”. The lovelocks of the Pont des Arts mysteriously disappeared during the night of 11 May 2010, but the Administration denied responsibility, until it was discovered that they had been removed by a student of the nearby École des Beaux-Arts to make a sculpture. Love locks immediately began appearing on the Pont de l’Archevêché. Can’t wait to get there and add our padlocks. Getting ready for Paris has been a joy but somewhat time consuming. 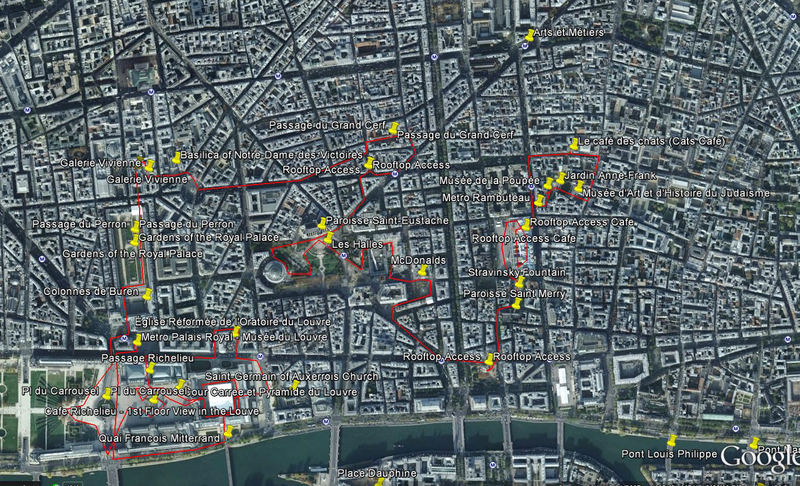 I’ve been doing a lot of Google Earth research work to lay out 12 day-trips with 171 venues that include 3 marches, 14 jardins/parcs, 36 ponts, 7 gares, 20 rooftop access, 13 Cite venues, 4 I’lle St-Louis venues, 11 passages, 42 Montmartre venues, 21 other must sees like museums and churches plus a day visit to La Defense. I’ve been doing some reading as well; I have read 1 hardcover, 4 paperbacks, 6 Kindle books, 7 Nook books and 45 i Books in preparation for this trip to Paris. On top of that I have been trying to get in shape to walk the hills of Montmartre and the 4th story walk-up apartment we are staying in, finding the best place to buy Euros, making airline reservations, finding an apartment in Montmartre, booking airport pick-up, getting passports etc. My wife wonders what I have been doing with my life since last April? “Preparing for Paris” I tell her! Here is an example of the planning that I have taken to just put one days worth of walking, site seeing, photographing and video taking together. I have listed all of the sites that we want to see on this trip and then pull them together into workable areas of the city that make sense to have an enjoyable day together. If you notice a McDonald’s on there, it is only listed on the map for the fact that they may have a semi clean restroom when we go by there, if we are in need of one then! Abbesses to Saint – Lazare change to Line 3 off at Arts et Metiers, get off and take some photos of the Metro off on area. Get back on metro and get off at Metro Rambuteau. Go down alley to Musee de la Poupee which is in the Jardin Anne-Frank, see if you can go through the back entrance of the Musee d’Art et d’Histoire du Judaisme and make a left and go up Rue du Temple to the next intersection and take a left on Rue Michel le Comte to #16 and the Le Cafe des Chats. Leave there and go the way you were walking to the next left of Rue Beaubourg pass the Metro Rambuteau to the eorge Pomidou Centre. Look around, go inside and end up on the roof for photos. Exit and go out the back and walk towards the river into the Stravinsky Fountain area, should be some cool shots here. keep going through to the Church, photo time, and then right about 3 blocks to the Saint-Jacques Tower, go up if you can. From here you are going to head West 2 blocks and take Rue des Halles about 2 blocks and then right over to Rue des Innocents around the square and to the McDonalds on the other side. From here wonder over to the Les Halles Plaza area and spend some time looking around and taking photos. Get a shot or two of the Paroisse Saint-Eustache Church. Now you will take the north east street of Rue de Turbigo about 2 blocks and then left on Rue Francaise and then right on Rue Etienne Marcl to the Tour Jean Sans Peur Tower, go up if you can, from here go to the next intersection and go left one block and then left again 2 block to the Passage du Grand Cerf, yes you were here in 2003. Exit other side and go left on Rue Dussours and the right on Rue Tiquetonne back to Rue Etienne Marcel but keep going straight. At Pl des Victoire go right 2 streets and take Rue Vide Gousset to Rue des Petite Peres and stop in front of Basilica of Notre -Dame-des-Victoires and take some pics. go lft and enter into the Galerie Vivienne and then wonder over to Galere Colbert and Passage Colbert and out the doors across Rue des Petits Champs and into the Passage du Perron which should be under the Gardens of the Royal Palace. Have fun take a rest and enjoy. Galerie de la Cour d’Honneur should be at the south end and make sure you find the Les Deux Plateaux, more commonly known as the Colonnes de Buren, is an art installation in the courtyard of the Palais Royal with all of the small black and white columns. From here you will exit and go over to the Pl du Carrousel and walk around the Louvre Pyramids. Exit through the East wall into the Cour Carree et Pyrmide du Louvre and go out the east side and there will be the Saint Germain of Auxerrois Church, pic time. Head away from the Seine and make a lef and then right acn come around to the front of Eglise Reformee de l’Oratoire du Louvre Church and then another left and then right down to the Passage Richelieu back into the Cour Carree et Pyrmide du Louvre and then go around the other side of it inside and exit the south side on to Quai Francois Mitterand and back down river to the Pl du Carrousel and trough to the Palais Royal-Musee do Louvre Metro stop. Take Line 1 to Concorde and then switch to Line 12 back to Abbesses. Well okay, I said no more photos from the past but, I had some questions about viewing more of my Paris photos from our past trips to Paris. Here is a link to a YouTube video of all the photos put to music. The video includes a cruise up the Canal Saint-Martin, a walk around Montmartre, a walk through Sainte Chapelle, the d’Orsay Musee, Luxembourg Gardens, over to and up the Eiffel Tower. The video is available at 720 HD, so enjoy with a glass of your favorite beverage! Cheers! Two weeks and counting, Yeah Baby! Paris 1998 and 2003 are now behind us! This will be the last photo of our past visits to Paris, we will now move to our planning, development and execution phase of the blog. As posted in the 21 Days and Counting, March 18th blog, I went over most of the planning sequence of our trip. So now I am going to show you some of the developmental processes that I have been going through to make this trip a success. After today, I will be posting and explaining our “Day Trip” planning! So for now Paris 1998 and 2003 are now behind us! Sundays were made for relaxing! What more can I say, it’s Sunday and Paris is the place to do pretty much nothing, well, if you live there and you aren’t on vacation there and just have 5 days like we did in 2003. 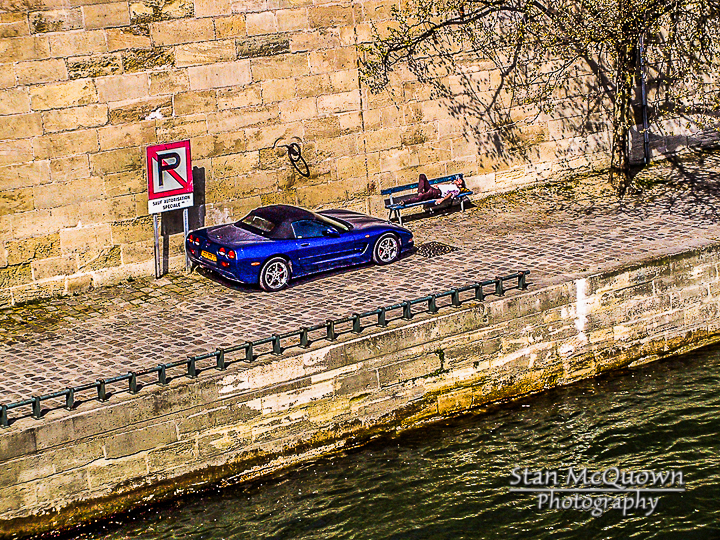 We were on our way to the Eiffel Tower crossing the Pont d’Iéna looked down at the Seine to see this beautiful Corvette sitting in a No Parking Zone with it’s owner taking a Sunday nap! Apparently all traffic signs are to be ignored in Paris? But, as I said, Sundays were made for relaxing! Oh what wonders can be found at the Les Puces de Saint-Ouen! Saturdays and Sundays are great days to go to the largest flea market in Paris, the Les Puces de Saint-Ouen flea market. Going to the Les Puces market is an adventure for the shopping senses, nothing will prepare you for what you will find and see! Our 2003 trip to Les Puces was great, an all day event, and we actually found something that we wanted to buy that we could actually take home with us without having to worry about extra baggage or shipping. 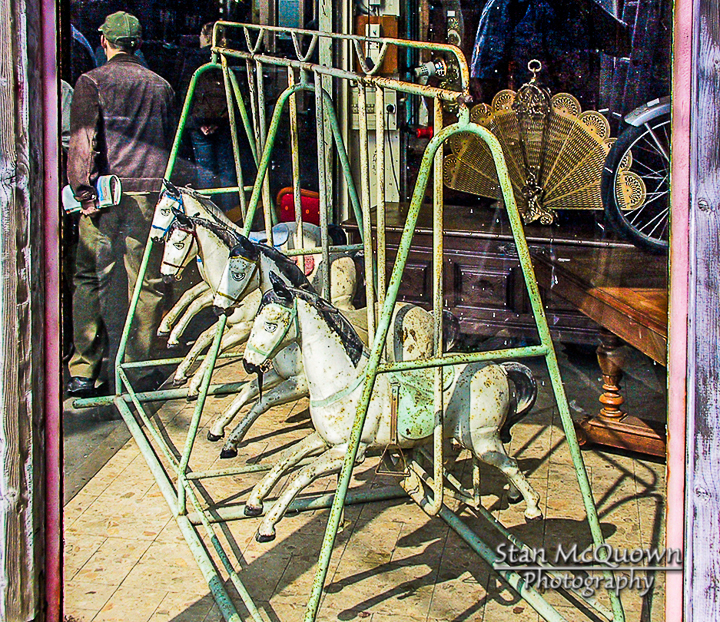 No it was not the item in the photo, the four horses, but escargot forks. They have worked out great when eating shellfish. The really fun and educational thing about the market is talking to the vendors about their wares. Most all of the items we looked at came from the late 18th and 19th centuries. There is a saying in France that explains the French way of life versus the American way of life, it goes something like this; “To the French 100 miles is a long way, to an American a hundred years is a long time.” Meaning we Americans don’t think about getting in the car and traveling 100+ miles in a day to go somewhere and the French don’t think of 100 years as a long time ago, most everything they own other than some clothes and their car, if they have one, are more than 100 years old. When we have an extra $1000 dollars to spend we think of buying something new, like a new stereo or tv, the French would go buy something old, like a piece of furniture or painting. We cannot wait to be there in a couple weeks and see what “NEW” things they have! Oh what wonders can be found at the Les Puces de Saint-Ouen!